This was one of the pamphlets that caught my attention – was it the turquoise that did it? (it’s one of my favourite colours) – who knows. But I’m glad I bought it. At first, from reading the cover blurb, I wasn’t sure. “Haunted by her son’s experience in Afghanistan…” created a sort of unfair knee-jerk reaction in me. There has been such a rash of war poems this year, some sublime but others less appealing. I don’t know what I feared exactly but as I read Isabel’s pamphlet I became increasingly engrossed. The poems are unsentimental yet full of compassion. There’s humour as well as pathos, commentary as well as reflection. 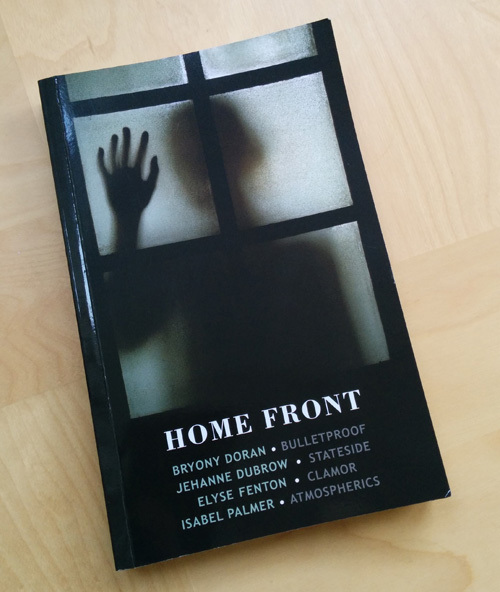 Some of the poems are from the point of view of the mother who goes about normal life at home ‘between / Watchfield and Swindon,/ outside the new police station, Adele on the radio,’ (‘Honour Guard’) but there are reminders everywhere of the war and its consequences. Yet we’re also in Afghanistan, immersed in the soldier’s life there, the characters and situations he encounters. Sometimes the mother’s and the son’s experiences conflate in a kind of fractured reality (‘Battle Shock’) or serve to remind us of the shocking transition from boy-child to man-soldier (‘Blueprint’). The closing poem, ‘Repatriation’, I found particularly wonderful. I won’t say any more about it as it might spoil the experience of encountering it after what’s gone before. ‘Ground Signs’ is a super pamphlet with so many strong poems – definitely recommended. I contacted Isabel via Flarestack and asked if I could reproduce ‘Worst Case Scenario’ here. I also asked her for a few words about the poem, and her reply is here in its entirety – and anyone who knows me will know how unprecedented it is for me not to do any editing! Coming from a family of soldiers, with a son preparing to do, arguably, the most dangerous job in the British Army, I had never thought of myself as a coward. Nevertheless, at that first family pre-deployment meeting on which the poem is based – and far too many times afterwards, when postmen, charity campaigners or trick-or-treaters called – I was much more fearful than I had ever expected to be. The first shock was how well-rehearsed the casualty notification procedure had become, with a timescale of ‘within two hours’ and how, for reasons never explained, the Captain, whom we knew and trusted, wouldn’t be personally involved. That job was left to ‘someone’, even though the Captain had, on at least one occasion, attended while bailiffs cleared a young soldier’s home of its valuables. They say that sailors are the most superstitious people in the military but the families of soldiers at war must come close. The ‘one sorry magpie’ seemed appropriate here, given the widespread tradition of ‘saluting’ a solitary magpie, showing due respect to a creature with a drop of devil’s blood under its tongue. Where superstition leads, prayers follow, ‘like a mantis, praying,/that rocks and ratchets/along a swaying leaf’, in much the same way as I imagined my son would soon be dodging enemy fire and sweeping the ground for IEDs. Inevitably at a meeting like this, questions about the more arbitrary aspects of military discipline surfaced, such as, ‘Why/ do they have to iron uniforms/ to go out on patrol?’ – especially for frontline infantry, like the Rifles, skirmishers who were the first to swap their red coats for camouflage – although this practice has now been abandoned, due to the cost and danger of supplying so much extra power to remote bases. It was that kind of humour that saw me telling the Captain afterwards all the times I would not be available to hear bad news – yoga (Mondays), the weekly shop (Fridays) – so that, when I told him I looked after my granddaughter on Tuesdays, ‘he didn’t write it down’, not knowing, I suppose, whether or not I was still joking. if bad news comes calling. and they’ll stay with you. to go out on patrol? to keep the bullets out. he didn’t write it down. Isabel Palmer is a former English teacher, educational adviser and European Championship silver medallist in triathlon. Her poems have appeared in ‘Stand’, ‘The North’ and ‘The Frogmore Papers’. ‘Ground Signs’ is her first published pamphlet collection. Thanks for the recommendation, Robin, I really like the sound of this book. And I agree, Flarestack pamphlets look beautiful. My response to being told of the personal visit if my husband should die on detactment was ‘ ‘Can you make sure it is written down that I do not want to see your Commanding Officer’s wife at my door? It was strenous enough to sit next to her at a funtion, let alone her coming to tell me your dead.